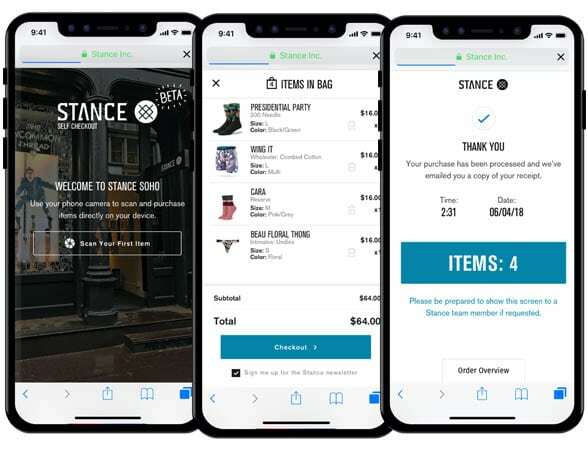 Specialist sock retailer Stance is enabling customers to pay for products on their mobile phones from anywhere in its stores — without them having to visit a physical checkout desk, talk with a shop assistant or download an app. Shoppers use the browser on their mobile phone to navigate to a short URL. They then scan the product barcode and pay on their phone using Apple Pay, Google Pay or a credit card. Customers have been able to use Stance Self Checkout at any of the retailer’s nine US stores since it launched the service during the 2018 Christmas shopping period. It is used by about 5% to 10% of shoppers daily Stance sales and operations lead Olivia Silarski told Chain Store Age. “Our Self Checkout solution allows guests to choose a fast, convenient alternative to waiting in line to pay. And it enables our store team to spend more time educating our guests on our quality and innovation, instead of being stuck behind a point of sale device,” says Stance executive vice president of direct-to-consumer Paul Zaengle. The mobile self-checkout service was developed in-house and built on Moltin’s API-first commerce platform, the retailer says.